The visualization needs for scientific computing have increased tremendously in recent years. Simple visualization tools such as plots or charts are no longer sufficient to peer through large data sets. A slew of visualization tools and associated hardware have been developed to meet these demands. MSI is well aware of the needs of the University community and has equipped its labs with high-end workstations with stereo capabilities. The LCSE-MSI Visualization Lab (LMVL) has three large rear-projected high-resolution screens for high definition presentations and interactive graphical analyses of very large or complex systems and data through the use of high performance networking, storage, and computational resources. Users needing remote access to visualization can get it using NICE, a web-based interface for remote access to MSI resources. MSI staff with specialization in visualization work as consultants with various faculty, staff, and students. MSI helped the Medical Devices Center create 3D models from CT scans of human anatomy. 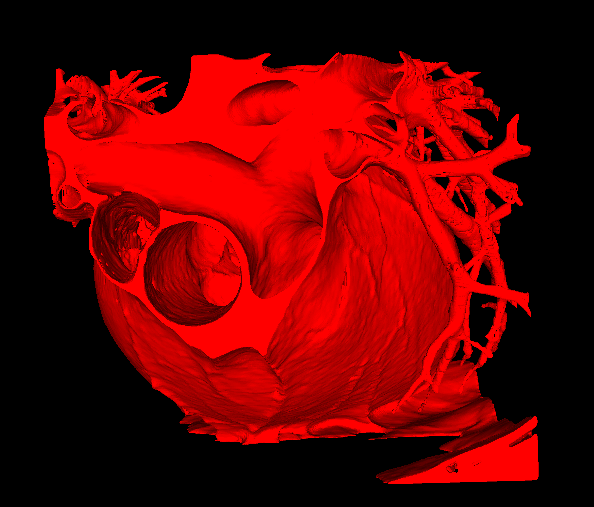 In the example shown above, 300 CT scans were used to create a 3D model of a human heart. After creating the models, MSI brought the models into a virtual reality environment available in MSI's LMVL lab enabling users to "fly" through the heart. The models can be used for anatomical training or to assist in placement of medical devices.